The following 3d illustrations were created as a design development exercise to test design solutions within Brookfield Place, formerly known as the World Financial Center, located in lower Manhattan’s financial district. 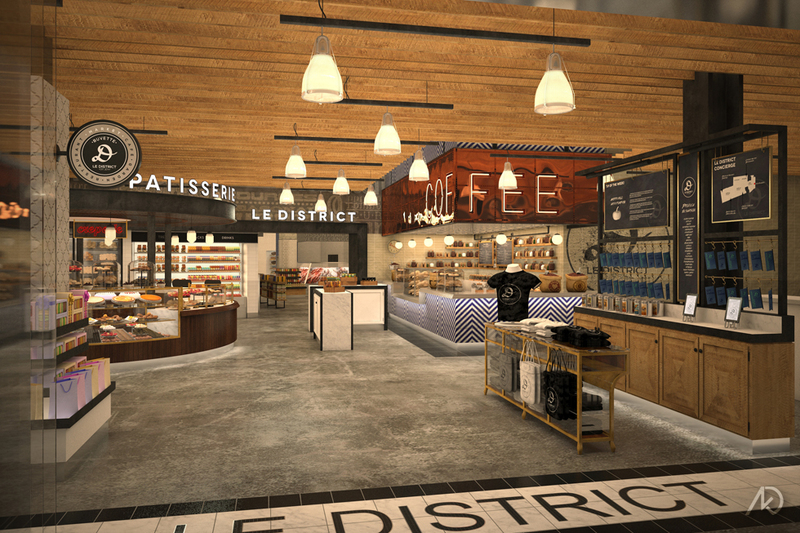 The project, Le District, will contain an open market with multiple specialty kiosks and food options. 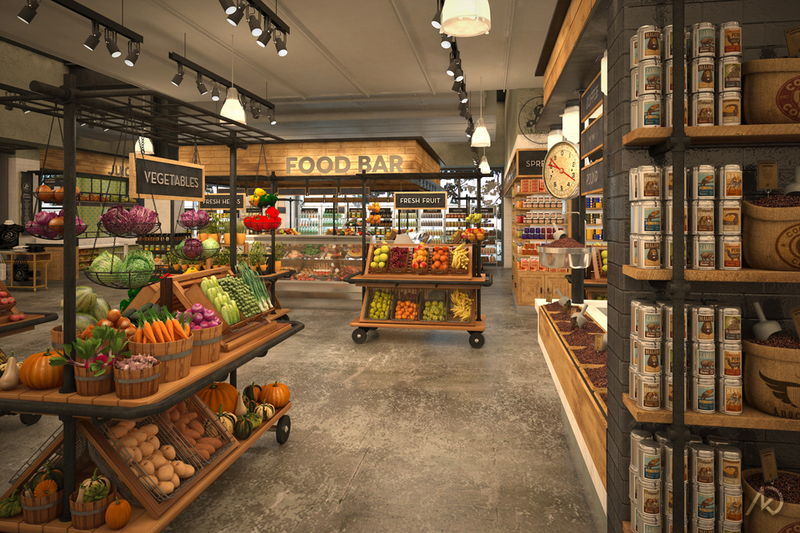 These renderings show some of the retail spaces within the marketplace. 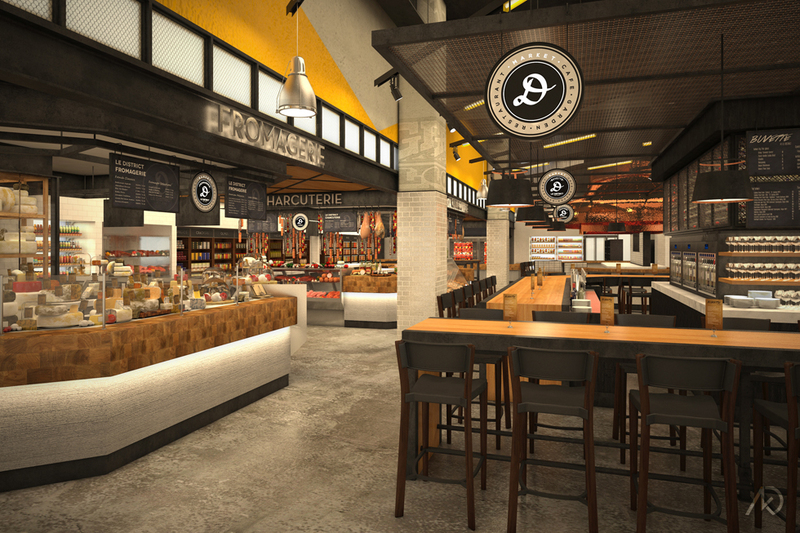 The market has somewhat of a rustic/industrial look and feel. The floors will remained slightly finished concrete while the kiosks use raw wood, metal, and simple storage elements. All design direction was given by ICRAVE. Most items in the scene (except for some of the products) were modeled, textured, and lit by kk. This image shows the latest design for the main entry, which is accessed via the Winter Garden. To the immediate right lies an information desk as well as market related merchandise. The primary room contains a pastry shop and a coffee shop which flank the main egress towards the fishmonger kiosk in the distance. This image shows the wine and tapas bar to the right, complete with storage and enomatics; as well as the cheese shop on the left. In the distance one can see the meat counter, rotisserie ovens, and miscellaneous retail shelving. The large copper hood, on the right/rear of the view, covers a lunch counter below. This image shows the main market area; where one can buy produce and raw goods. One can see the typical produce gondolas as well as the coffee display on the right. 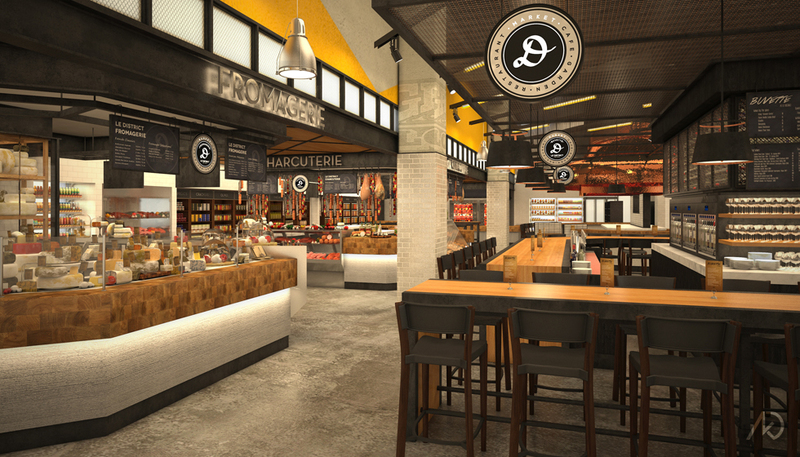 In the mid-rear of the image lies the prepared food and deli kiosk. To the left of that is a juice bar (barely visible behind the vegetable gondola). The perimeter walls contain specialty product shelving.